Col. Winstead’s body hit the railing with such force that it actually bent the ironwork, as you can see here at WTVR. 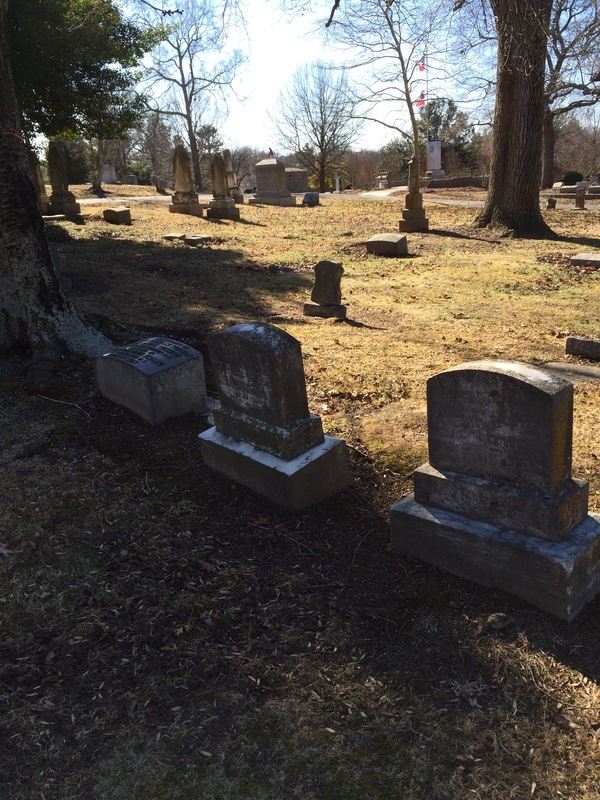 The video in that link also includes a photo of Winstead, probably taken much earlier than the date of his death, as well as an image of his grave marker in Greensboro’s Green Hill Cemetery. His unexpected and unexplained suicide caused his loved ones to speculate that he’d fallen or that he’d been pushed. Panicked bank customers in Greensboro rushed to withdraw their money, thinking that he’d taken his life due to financial troubles at his branch. Another article I found about Winstead’s death paints a more vivid picture of the final moments of his life and the first moments of his death. “FLUNG HIMSELF FROM A TOWER. 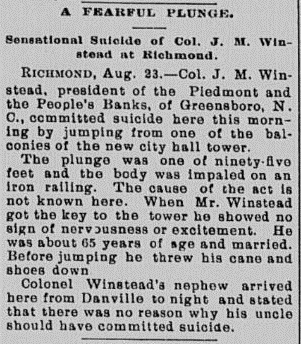 RICHMOND, Va., Aug. 23-Col. J. M. Winstead, President of the Piedmont and People’s Bank of Greensboro, NC., committed suicide here this morning in sight of hundreds of people. He was a fine-looking gentleman of 70. 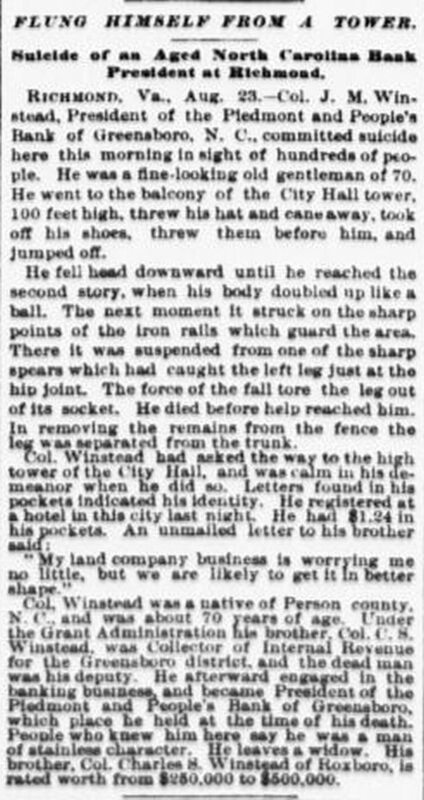 He went to the balcony of the City Hall tower, 100 feet high, threw his hat and cane away, took off his shoes, threw them before him, and jumped off. He fell head downward until he reached the second story, when his body doubled up like a ball. The next moment it struck on the sharp points of the iron rails which guard the area. There it was suspended from one of the sharp spears which had caught the left leg just at the hip joint. The force of the fall tore the leg out of its socket. He died before help reached him. In removing the remains from the fence the leg was separated from the trunk. After a number of visits I finally found J.M. Winstead’s grave marker at Green Hill. 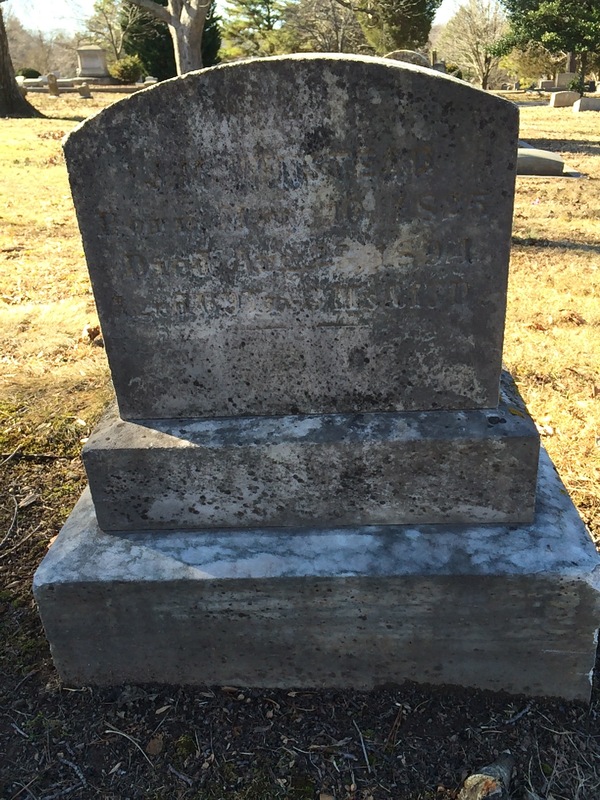 He is buried beside his wife, Maria Black Winstead. Col. Winstead’s grave is on the far right. *This entry was originally posted in 2013.